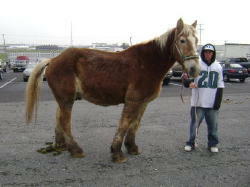 Leroy is reported to have been an Amish workhorse, who was then sent to auction and bought as a hack horse. I have no idea for how long he had each job. For whatever reason, he then went to auction, and was bought by a broker, then sold to another broker, and on and on he was passed between brokers for a number of months. 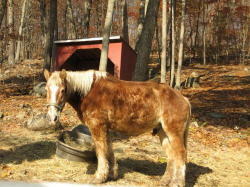 On 10/18 I noticed him on the AC4H website under “broker owned” horses. My husband had been interested in a Belgian for awhile. He doesn’t ride and isn’t a horseperson, so he only wanted a Belgian to look at. An old fellow in need of retirement would be a perfect fit. Leroy caught my eye on the AC4H broker page. I sent the email over to my husband, but he didn’t get online until 10/21, a Sunday. 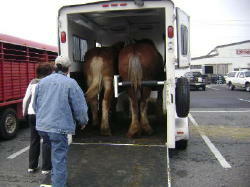 The horses have until Monday, as the truck ships for slaughter on Mondays around 5:00. When my husband asked for more info, I inquired more about his personality, etc., and in a flurry of emails and telephone calls I was able to Paypal his ransom to AC4H at around noon on Monday, while AC4H was at New Holland with the Inside Edition camera crew shooting a story. Leroy made it by the skin of his teeth! 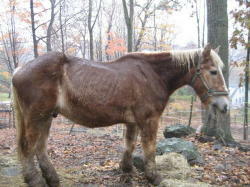 He was quarantined at AC4H for 2 weeks, and finally arrived in Connecticut on Veterans Day, 11/12/07. How appropriate for this old, veteran workhorse. 11/12/07 — Drizzly, rainy and dark, and Leroy arrives. Thank you, Brogan, for bringing my boy!!! He unloads in the driveway and walks up the hill to his new paddock like a good boy, only calling once to the girls who were very interested in who the new arrival was. Leroy is famished! He dove his head right into the leaves before he even saw the hay about another 4 feet away from him. We settle him in with hay and water, and I lead him up to the shed because its raining, and my husband gives him a good looking over, and pets him while he’s eating. All loaded up and coming home! He settled right in to stealing his traveling partners hay, so I’m told. 11/13/07 — Photos from the next morning. Now I can see in the daylight that Leroy is VERY underweight. His spine and withers are protruding, you can count every rib, and he has absolutely no muscling to his hindquarters at all, he is just bones. He also has a big “wattle” of skin hanging off his neck, where its obvious he had a big, cresty draft neck at some point in his life. Leroy also doesn’t have any use for humans. He won’t take his eyes off me, and he watches me everywhere I go, and everything I do. He doesn’t want to be caught or touched, at all. I can stretch my hand out to let him sniff my hand, but that’s it. I have attempted to gently stroke him, but he just walks away. He watches my every move, and never takes his eyes off me. So I just sit on a rock while he eats for 20 minutes or so. That night, I decided to measure him for a blanket. I had my husband hold him (he couldn’t catch him, but I was able to, eventually) and I tried to measure him. He danced around and did not want me to touch him with “that thing” (a weight tape). I did finally get a kind of estimate of his size, 94″, he’s a big boy (or was). Wednesday 11/14, I started Leroy on grain today, 1/2 pound Vitaroyal 2x/day with 1/2 cup of oats, Probios and Ration Plus. Leroy let me brush him! But then I got greedy and decided to see if he would let me put a blanket on him. Nope. As soon as he saw “that thing” coming inside the gate, he left. So I gave up on that idea, and hung it over the big brush scratcher thingie so he could see it. Thursday 11/15 I stretched my hand out for Leroy to sniff me like I do every day, and he seemed interested. I went to stroke his head, and he gave me that snarky lip thing like “If you touch me, I’ll nip you!” I told him that was rude, and let him be. But later on that night, I got a nicker when I came out with hay! 3/4 lb. VR w/Ration Plus and 1/2 cup Canola oil. It rained all day today, and is getting cold tonight, and Leroy did not go in his shed all day, so he’s wet. I hope he doesnt get cold tonight, I gave him a full bale of hay for the night, and he has a bunch more in his shed, if he just goes in it. 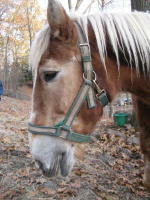 11/19/07 – Here are Leroy’s 1 week later photo’s. He still doesn’t want to be caught or touched, but he follows me along the fenceline when I feed the girls and clean manure, he greets me at the gate, and I even had a couple of nickers. 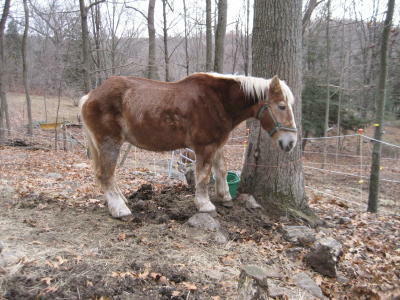 He lets me move all around him and isn’t worried at all, I can shovel manure all around him with no worries. He wants to be friends, its just going to take him some time. Baby steps…..
11/25/07 — This week, Leroy finally laid down to sleep at one point, he had leaves in his tail and a bit of wet soil on his belly. Judging by the mud on his legs up to his knee, and his otherwise clean coat, I do not think he has laid down and had a good sleep for many, many weeks (or longer). 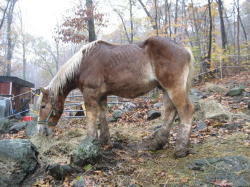 He decided to use his run-in shed when we had a lot of very, very heavy rain followed by a big temperature drop, and I was pleased to see that, he is smart enough to know when he needs to stay dry, and also that he is confident enough now to be out of sight of the other horses. 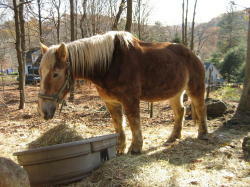 I continue to spend time just sitting on a rock while he eats each day (weather permitting), and on Wednesday, I stood next to him in the afternoon sun while he ate his hay, and he ever so slowly took one half step sideways toward me (I was standing about 3 feet from him, at his shoulder). He had his head/neck curved toward me, and was choosing to eat the hay on the side of the tank in front of me, rather than directly in front of him. Then a few minutes later he took another half step toward me, then another, and another. The entire time he kept his head/neck curved toward me, and I could just feel his energy next to me. It was so nice! Then he shifted his hinds away from me, so he was standing more facing me. Baby steps, but its progress! Then yesterday (Saturday) I stood next to him for awhile, and was able to stroke his shoulder! I immediately walked away to give him a big release, and stayed away for about 5 minutes.Then I came back for another gentle stroke of his right shoulder, and on the second stroke, he swung his head at me, not aggressively, but defensively. So he had enough, and I just stood with him for another few minutes, not moving, then left for the day. This morning (Sunday), my husband fed, and being a non-horsey person, he didn’t even think, just walked right up to him while he was eating, and was scratching his shoulders, rubbing under his mane! LOL! I didn’t try to pet him today, I decided to just back off a little, and tomorrow I’ll try to give him just a stroke while he’s eating, or perhaps I’ll just take hold of his halter then immediately let it go, and do that for awhile so he learns that being caught doesn’t = work/bad things. Currently, he is eating 1 lb. VR 2x/day with 2 cups of oats, a 1/2 cup of Canola oil, a joint supplement, probiotic, and Nutrient Buffer (a gut buffer for ulcers/leaky gut). He has had 2 doses of Safeguard so far, 1 in quarantine, and one at the beginning of the week. Here are some photos from this (Thanksgiving) weekend. you to come visit! Can we be buddies? 12/2/07 — This week has been very, very cold, we’ve had, snow, sleet, ice, then rain. Leroy is smart enough to go in the shed when it rains then gets colder, but when the storms get warmer, he doesn’t go inside. Smart boy. He knows how to break the ice on his tank, which I figured he would, considering the Amish don’t have electricity. I continue to just feed and talk to Leroy, and sit with him when the weather is OK. I tried increasing his grain this week, but he is refusing it, so I knocked it back down again, and he’s finishing it up. He is still on the VitaRoyal Untie (almost out), Nutrient Buffer, and joint supplement. On 12/2 Sunday afternoon, Pam Sourelis contacted Leroy via distance for a Reiki healing session, communication, and Neuromuscular retraining. Pam is in Illinois, Leroy (and I) live in Connecticut. When he came into the room, I immediately felt his deep sadness, his tears. And the fear that his body was holding. I told him that this is his forever home. This is not a stop on the way to somewhere else. This is where he will live out his life. He melted into that news. When I began to place my hands on him, he made it known that he wanted them on his left knee, which I held for quite awhile. I then sent Reiki energy up through his seat bones, along his spine, through his poll. I did not sense any specific problems in his spine. He just seemed to be tense overall. I then gently rocked his body from sternum and hind end, one hand on each. (This is the beauty of distance work. My arms have the reach of a giant.) The sternum seemed tight, so I let it be. I took his left shoulder in very tiny half circles; it was too tight for a full circle. I then returned to his left side. I briefly rocked him from shoulder and hip (briefly because the nervous system quickly transfers information from one side to the other, and I had spent quite a bit of time doing this on the right side). I also did the ribcage circles from his underside and then took his shoulder in a gentle circle, a complete circle this time. At this point, I asked him if he had anything he wanted to say. He was quiet. This was not a sullen or frightened silence, but a contented melted-butter silence. It was as though every ounce of anxiety had oozed out of him; it was as though he had completely let go of his ugly past. it was amazing. How fabulous if humans could learn to do that. I told him this was very good news, that everyone wants him to stay around for quite awhile. I told him that he could just rest and recuperate this winter and then maybe next summer he could work with children. He seemed satisfied with this response (which I hope was an accurate response). At this point, I thought we were finished, and so I swept his aura, but he showed me that he wanted Reiki up through his feet and legs, and so I did that. What a gorgeous, sensitive, loving, fabulous creature. Thank you so much for allowing me to work with him. Feel free to contact me with any questions. You know whats really, really interesting? I went outside about 2:10/2:15ish, and Leroy was standing in his regular dozing spot. He wasn’t sleeping, his eyes were half closed, but his ears were back (not pinned, but paying attention to behind him — I did come up behind him, but they were like that before he could see or hear me, and stayed that way even after I sat down). 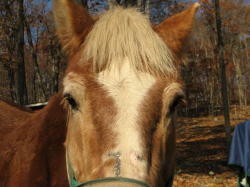 I sat down on the sill of the door of my barn, where I could see him, but be sort of out of the way (damn, it was cold!! so I didn’t stay long). I sat there for a few minutes, and said to myself: “I don’t see a thing” (lol). So I sat and just watched, and I SWEAR to you, I saw his body rocking! When I focused my eyes on him, his body seemed to be rocking or swaying back and forth, or front to back, but I couldn’t discern when it changed, it was so subtle. But when I softened my eyes so that I could see him in relation to things around him (i.e., trees, the scratchy brush thing he was standing next to), I could tell that he wasn’t physically moving or swaying. It was like an eye trick, when you focus on something to hard, it looks weird. I shifted my focus 2 or 3 times, with the same results. So that’s what I thought it was, just my eyes being kinda weird from focusing too hard or something. Obviously, I was wrong. How cool is that? A couple of times I saw his head sort of bob, he would bob his nose toward his chest then bounce it back up to neutral again. He did this 2 or 3 times. He definately had a very inward look, he was focusing and processing. That evening, I was able to pet Leroy briefly on his shoulder, and he did not make even a little grumpy face at all. I just gently stroked his shoulder while he was eating his grain, then left him alone. The next morning (Monday), I gave him his VR, shoveled his soaking, frozen elephant manure. When he is finished with his grain/VR, he always comes to me to tell me he is ready for his hay. He came right up to me, stood squarely in front of me and blocked my path. He wanted to say hello! So he stood there looking at me for a good long while, probably a good 5 minutes. 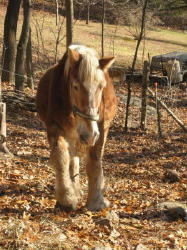 Then he walked over the gate where the hay is stacked. He stood blocking the gate, so I couldn’t get out. I came over and just stood in front of him, and his nose was probably a foot from me, he sniffed my hand, sighed, softened his expression. He was looking right at me, very softly. Then he squared up his feet/position and just planted himself there. He just wanted to stand with me for a bit and relax. So we did that for a bit, then I brought him his hay and he didn’t get worried when I had to squeeze by him (which is good). He followed me over, I put his hay in his tub, and fluffed it all up, with my head down by the hay while he ate, which he likes, I think it is like eating with you, when you are bent over with your head down like that. 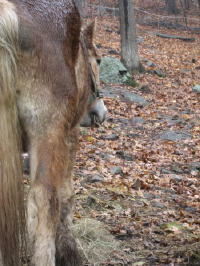 Then I stroked his shoulder and rubbed his withers (as best I could with gloves on a wet horse), and he curved his head/neck around in my direction, instead of away. One of the things I’ve learned from Jocelyn and Dan ( Sumerel’s ) clinics I’ve attended is that everything a horse does means something. Every step, every half step, ever turn or shift of their weight, every glance, it is all a message, telling you what the horse is thinking. 12/3 – Tuesday morning. Guess what I did this morning? After getting a HUGE (admittedly wet and drooly) nicker this morning, fed Leroy, then brushed him, head to toe, front to back!!! He loved it, kept a soft eye and just soaked it up. I found the “magical” itchy spot, and he leaned in, stretched his neck and lip out. WAHOOO!!!!!!!!!!!!!!!!!!!!!!!!!!!!!!!!!!!!!!!!!!!! Can you just feel my excitement? It was all I could do to not wrap my arms around him and give him a huge hug. Oh, so I got up close/personal look feel, those shoulders definately are remodeled bone, its like a shelf there that the collar was against. Left side worse than right. I can’t imagine the constant, unremitting pain he must have endured. And some skin greeblies it looks like, a few bald patches and lots of white flaky stuff. VR should set that right in a couple of months. After all this time, 3 weeks of spending time with him, and trying to pet him a couple of times a week, and after ONE session with Pam, via distance even, he has made leaps and bounds progress that would have taken many more months considering how far we were going. I am amazed, and thrilled, and overjoyed, like a kid at Christmas to have discovered a new, fabulous toy under the tree! Here are the notes for Leroy’s second session. When Leroy came to me last week, I was struck by his intense sadness. Today. I was struck by his intense joy. When he entered the room, I felt my heart chakra open and fill with love. I had this huge grin on my face. Leroy was emanating this glorious light. Pure joy. He came very close to me; If he had been physically present, I would have felt his breath on my cheek. Last session, he was very attentive, but he was somewhat emotionally removed. Not today. My plan had been to work with his body, going to the next level with the Neuromuscular Retraining work. This was not, however, his plan. Eventually, he allowed me to move my hands. I channelled Reiki to his left shoulder, which drew in a great deal, and then took the shoulder in circles. Last week, the circles were a bit creaky. Today, they were free and elegant. I then went to his right side. I channelled Reiki to his right shoulder. But he did not want me to move the shoulder. Then I placed my hands on his sternum and took it in fabulous, large, smooth circles. This is very important! 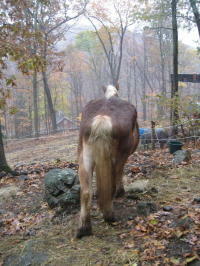 He was very tight in this area last week, but now has greatly increased mobility. A smoothly moving sternum positively affects the movement of the entire body. I then moved my hands down his body, briefly channelling Reiki to the other chakras. 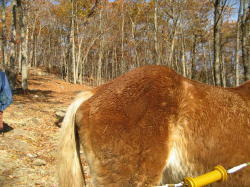 When I reached the hind end, I sent Reiki up through the seat bones and along his spine. He clearly was not very interested in body work today, but having spent so much time on his front end, I wanted to make sure he was somewhat balanced in his body. I also briefly sent Reiki along each diagonal. I swept his aura to end the session. Thank you so much for allowing me to work with Leroy. He is an amazing, huge, light-filled spirit. He is a very powerful teacher. When I went out for the evening feed tonight Leroy greeted me at the gate with a HUGE deep whicker (so cute). 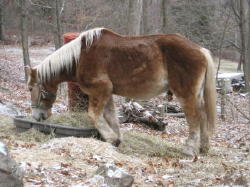 When I came in with his bucket of grain, he was VERY excited for his dinner, I have not seen him this animated yet. He was very anxious for me to get that bucket put down so he could eat! He has never done this before, was always interested in mealtime, but very quiet and low-key about it. For the first time, he was trying to stuff his head in the bucket before I had it put down! Yes, sounds weird that I’m excited about this, but it is what NORMAL horses do! 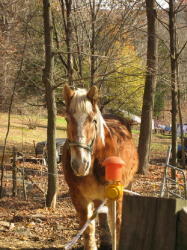 (Incidentally, I don’t allow this behavior, and I use the cue: “Wait”, with a hand held out like a stop signal, then when the horse stands quietly, not dancing around or trying to swing their head in, I remove my hand and give the cue “OK” while stepping back from the bucket to indicate it is OK for them to eat now. I do not hang the bucket and allow them to eat until they stand quietly, and I build on this until they stand quietly while I approach them, halter them, and place the bucket, but of course, baby steps first, and I “release” when they stand quietly for only a second at first). He completely finished his VR, and licked his bucket clean, also a first. His feed was no different than it was this morning, or yesterday, or last week, but he licked that bucket clean, instead of leaving half or a bunch of mouthfuls in the bottom, which I then dump onto his hay in the hopes he finishes it. 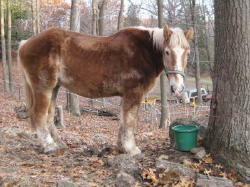 I got another huge whicker when I started carrying his hay, and for the first time I was able to touch his right shoulder to guide him to turn away from me and walk on ahead of me to his hay tub. Before now, he would not walk on ahead of me at all, I would have to maneuver around him and get ahead of him, and he would follow me. He didn’t walk ahead of me the whole way, but he did halfway, and I’m assuming that this is an increase in trust on his part. I’m excited to see what tomorrow will bring! After this last session, I was able to get Leroy right up to the amount of feed he should be at, 2 pounds of VR and a quart of oats 2x/day (and his joint supplement — he is finished with his Nutrient Buffer, he was on it for a month, and so far I don’t see the drooling return). He is now excited for his bucket, and licks it clean, then eats up the bits he dropped. This was not so for the past month. He nickers when he sees me, a deep, throaty nicker, and comes sauntering over to say hello. We have been working on “catching”. 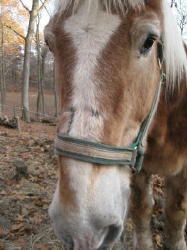 I take hold of his halter, and his first reaction was to brace, the raise his head and turn it slightly away. 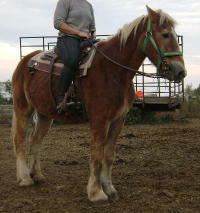 I just held on, applying only the pressure that is the weight of my hand, and waited for him to relax his neck muscles. Then I let go and give him a good scratch on the neck. We repeated this 3 times the first day, then on the second day we again did it 3 times (Leroy’s choice, he walks away when he’s done) and on this day, only the first time I took hold of his halter did he turn away, the 2nd and 3rd time he still braced. 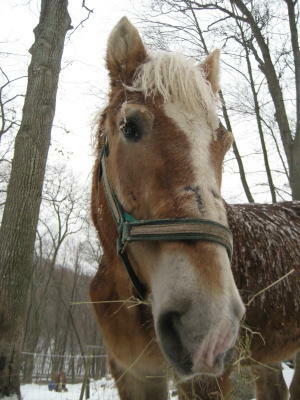 By the third day, I just hold out my hand, and he offers me his halter/face. How sweet….. His first reaction is still to brace, but now it is only for a second, then he remembers that when he softens, he gets a scratch. Here are the notes for Leroy’s session. I channeled Reiki for a minute to connect with him, then began the body work I’d hoped he’d let me do. I began by taking his sternum in small circles. It went smoothly in both directions, which is great. I then took his left shoulder (the one that had been very stiff before) in small circles. The movement here was smooth and effortless as well. Then, still on his left side, I gently lifted his ribs towards his spine and gently slid them towards his head and towards his hind end. These were tiny, smooth movements. The intention was to show him that comfortable movement is possible in his ribcage. I also wanted to show him the connection between various parts of his body. I began with one hand on his left shoulder, the other on his left hip. I channeled Reiki to these two areas and gently, rhythmically rocked his body. I did the same with one hand on his ribs, one on his hip. Then one hand on his hip, one on his greater trochanter. I then sent Reiki and movement up through his seat bones. The movement seemed to go through smoothly; I didn’t notice it catching anywhere. I then moved to his right side and repeated what I had done on the left. He then directed me to his neck. I channeled Reiki on the left side and then on the right. He then presented his chest/heart chakra. I channeled Reiki to this area. My sense of him throughout the session was that he is solid, centered. It is clear that he has fully accepted your home as his. There is no fear, no tension. He is open to learning and said he is ready for his new job. He is grateful for the three healing sessions but feels he is fine now, that he has “recovered,” and no longer needs my attention. He is concerned for you, Michelle, and would like to assist you in your healing. He sees himself as a source of power that you can draw from. He says he will not be depleted because he has been reconnected to “Source” and the energy is flowing freely. He also said he would like a closer relationship with your children. I’m going to miss working with this big, gorgeous guy, but I am thrilled that he doesn’t need me anymore. Thank you again for allowing me to work with him. And thank your for taking him into your home and your heart. I am SO THRILLED with his progress. Leroy has moved forward by leaps and bounds since Pam has worked with him. He is acting like a normal horse now. He gets excited for his dinner and dances waiting for it to be prepared, he is anticipating my movements in delivering the feed, so he is learning the “wait” signal, which he learns very fast. I am now able to somewhat influence his movement with just a wave of my hand, to have him move out of my way so I can deliver his hay (he likes to stand in front of me and block my path). I can pet him all over his body. I have not tried the legs yet, but I don’t expect much problem. I’ve scratched his forehead the last couple of days, and he liked it. This is new, he wouldn’t let me touch his head at all before. My friend, Judith, stopped over to meet him yesterday. He was slightly standoffish to her, he didn’t really want her petting him, but he was polite, and sniffed her outstretched hand, and just moved out of the way when she asked to pet him (sound familiar?) 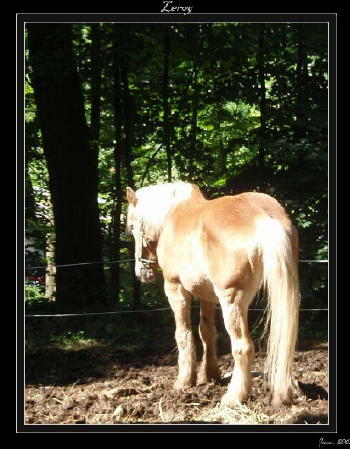 So I hope to have people come visit him, and he can learn that I am not the exception, but his past humans were the exception, and other people are good, and kind, and friendly, and don’t hurt horses. 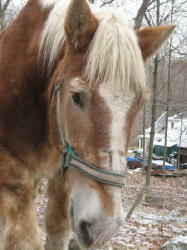 Oh, and Leroy let me put a little Christmas bow in his mane for my annual “torture the ponies for pictures” session. I also had a Christmas tablecloth in my bag, that I drape over their backs. I had no intention of doing so with Leroy, I actually only came into his paddock for a scratch and a “Hello, Handsome” (which is my nickname for him). But when I removed the tablecloth to dig out a bow, he got concerned when he saw that “big thing”, kinda gave it the hairy eyeball. So he still didn’t seem to want anything to do with tack/etc. on his body. We’ll get there. I did rub his shoulder and back with some baling twine I had in my hand, and I’ll start using different things like washcloths, etc. Leroy showed no signs of illness. He was happy and relaxed, sound, and ate well. He was here, busily munching hay one moment, and then gone the next. I am grateful, however, that Leroy took the decision out of my hands, for once. He did not suffer, he was happy until he was gone. It appears as though he was gone before he hit the ground, there was no sign of struggle at all, not even a moved foot or tail. Just gone. Leroy, you touched so many peoples hearts. I have received hundreds of emails, from people whom you have touched in some way. You opened many eyes to the life that workhorses lead. You bore your suffering in silence. I, however, could not be silent about it. You were a loving, gentle, sweet old soul. I will always treasure the 9 months that I had the pleasure of knowing and loving you. I trust that you are back with Ana , keeping her company over the Bridge, and sharing her love and companionship again. Goodbye, Leroy. I’ll never forget you, my sweet old man.